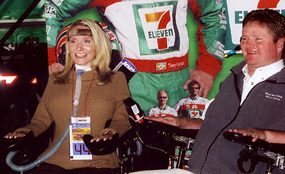 A Day at the Races: Heather with Sam Schmidt at PIR in Phoenix, AZ in 2005. During the years since the incident, Heather’s family has been doing everything they can to keep her alive and well, but expenses are high, and they need as much help as they can get. There are many ways you can help, such as donating once or donating monthly. You can also help without donating money. You can support Heather’s cause by learning more about Domestic Violence, and you can also contact popular television programs listed below about featuring Heather’s story. If you would like to give a certain amount of money to Heather’s family each month to help her family with expenses, you can choose one of the following amounts and that amount will be automatically deducted from your Paypal account each month. You will be able to cancel your monthly donations at any time by logging into your Paypal account. Below is a list of links to Domestic Violence websites. Below is a list of links that go to the contact pages of television programs. Nothing helps more than spreading the word, and being featured on a major network will help Heather very much. Below is a list of links to Paralysis Organizations. Please help us spread the word by putting a link to this site on your site. Heather's family needs all the help they can get. Thank you!